in your current working directory and check out the master branch. For compilation and installation instructions, open file doc/start.html located under your Toast root folder, go to Installation Guide, and see the relevant section for your platform. depending on the shell environment (csh or bash) you are using. You will need a recent version of gcc, g++ and gfortran installed on your system. 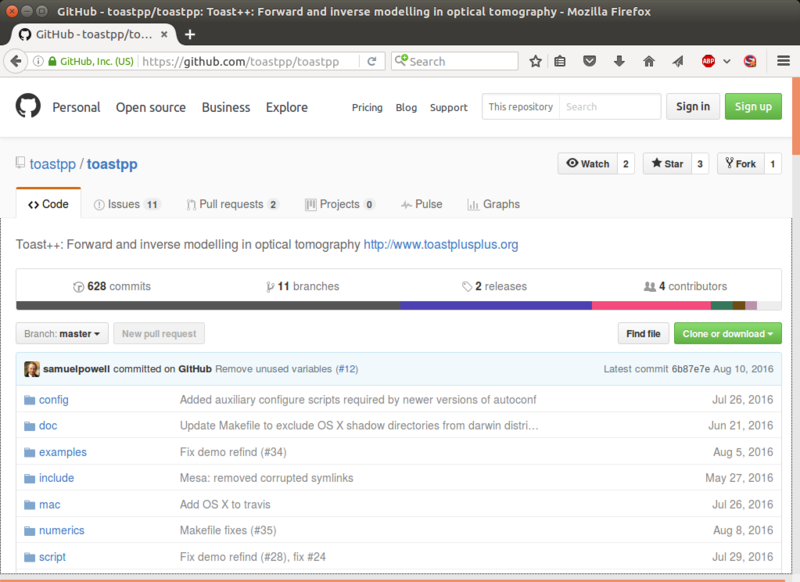 To compile the Matlab toolbox bindings, you need to have the Matlab MEX compiler installed on your system. Make sure that the mex executable is on the search path; alternatively, you can set the MEXBIN environment variable to point to the mex compiler. Note that on some Linux systems, mex is an executable associated with the LaTeX typesetting system. If you get nonsensical error messages from mex, make sure you are using the correct executable! This will set up the Toast search paths and give you an option to store them for later sessions. 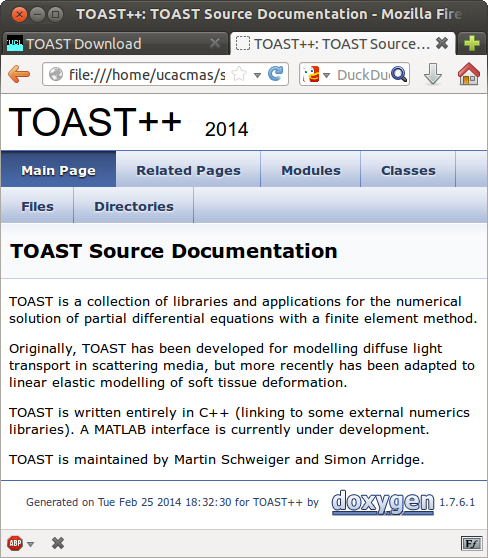 You are now set to use the Toast++ toolbox. This requires Python 2.6 or later installed on your system. This requires a recent version of doxygen installed on your system. Go to the win directory. Under the VS2005 and VS2008 subdirectories, you will find solution files for Visual Studio versions 2005 and 2008. Solutions for more recent versions will be added shortly. In the meantime, you can load the 2008 solution files and let Visual Studio convert them to your version, if necessary.